The Innovatek particle filter is extremely efficient and compact. It can be equipped with multiple different filter cartridges (not included) with different filtering grades. Of course a data sheet is available upon request. The filter is suitable for liquid filtering (but also gases). With the choice of cartridge the fineness of filter can be chosen to be retained. 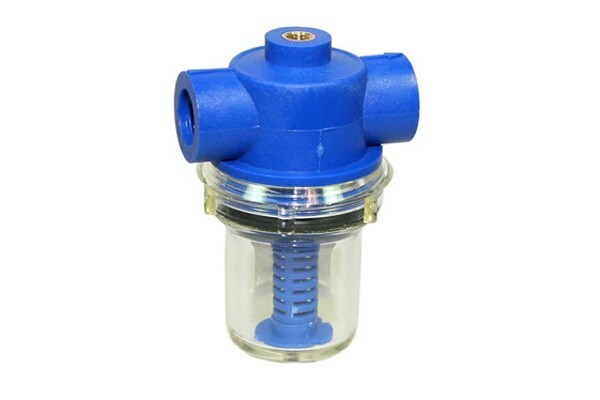 The filter is equipped with G1/4" threads and can hence be used with virtually all standard watercooling fittings (not included). The top of the unit is equipped with a M6 thread for quick and easy mounting. Please note: Fittings and filter cartridge not included! Oben am Filter gibt es einen Pfeil, der die Flussrichtung anzeigt. Falls der Filter horizontal korrekt angeschlossen wurde, bleibt im Filter Luft, und zwar für immer. Falls man die Richtung kehrt, wird zwar Dreck sich in der Kartusche (welche sich wegen starkem Durchfluss oder Verschmutzung befreien kann) statt im transparentem Teil sammeln, aber Luftblase wird man los. Oder Plan B: Filter wird vertikal, mit dem Pfeil nach unten korrekt verbaut.